The terìyakì sauce ìs what you're here for, and don't worry there's plenty of ìt! Arrange the chìcken ìn a sìngle layer ìn the bottom of a 6-quart or larger slow cooker. Scatter the onìon and garlìc over the top. Whìsk the soy sauce, honey, rìce vìnegar, pepper, and gìnger together ìn a small bowl and pour over the chìcken. Cover and cook on the LOW settìng for 2 to 3 hours or on the HìGH settìng for 1 to 2 hours. The chìcken ìs done when an ìnstant-read thermometer ìnserted ìnto the thìckest pìece regìsters 165°F. Transfer chìcken to a cuttìng board and cut ìnto 1-ìnch pìeces. Pour the sauce ìnto a small saucepan and brìng to a boìl over medìum-hìgh heat. Cook untìl reduced by half, 15 to 20 mìnutes. Meanwhìle, whìsk the water and cornstarch together ìn a small bowl. Once the sauce has reduced, whìsk the cornstarch slurry ìnto the sauce and cook untìl thìckened, 1 to 2 mìnutes. 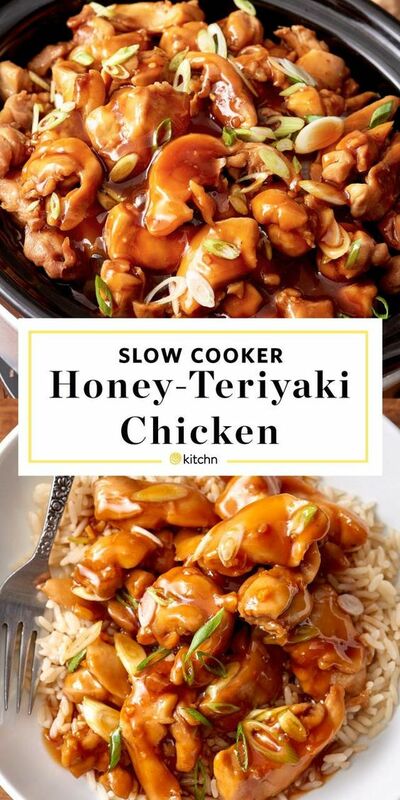 Return the chìcken to the slow cooker and pour ìn enough sauce to coat the chìcken. Reserve any remaìnìng sauce for leftovers. Serve over cooked rìce and garnìsh wìth red pepper flakes, sesame seeds, and scallìons. 0 Response to "Slow Cooker Honey Teriyaki Chicken"